Few marketers have spent time throughout the c-suite as a CTO and CEO, have formal training in computer science, hold a degree in business, and understand the complexity of the breath of technology facing marketers today. Daniel Chalef is one of the few marketing and product professionals in this category. Originally from South Africa, he graduated from University of Capetown with a multidisciplinary degree is business and technology. After eight years of technical work as an developer in South Africa, Daniel founded sales acceleration vendor, KnowledgeTree, as CEO and CTO. 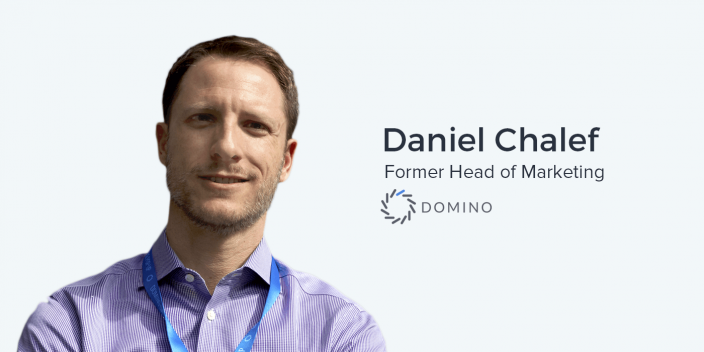 Most recently, Daniel worked as the head of marketing at Domino Data Lab, a platform centralizing the work of data scientists. He is now working as a Contract CMO and marketing consultant for companies like Crunchbase, Mixpanel, and several early stage startups. As important as it is to be able to manipulate numbers to generate compelling evidence for important business decisions, it is equally as essential to be framing and asking the right questions in the first place. You need to be able to frame the questions that guide your understanding of your business. And so there’s no point trying to manipulate numbers if you haven’t framed the questions properly...Data is misused, it’s misinterpreted, and too often, as I mentioned, we ask the wrong questions or aren’t framing the questions properly and they don’t really deliver insight. The misuse of data is a serious problem. In fact, it can be an even bigger threat to business than not having the data at all. The granularity now achievable with advanced measurement techniques, data warehouses, and increasingly complex SaaS products, is only useful if you execute on it. Too many times, too much time is spent analyzing data instead of executing on the insights your data provides. Don’t get too hung up on the data and anxious about it. Ensure that you’re using it in the right way, which is to delight customers. Don’t overthink and over complicate your analytic strategy. This, of course, relies on asking the right questions for the data to answer. Additionally, execution is frequently to only way to generate additional insights and more data for future insights. One of the biggest coming changes in the way we look at data is the diversification of data sources, especially for hardware or consumer facing businesses. We’re seeing IOT becoming a very interesting data source for marketers and I expect that that will increase. I expect that things like virtual reality, augmented reality, and data from services and tools that offer augmented reality and virtual reality might start to, on the consumer side, become an interesting source of data for consumer marketers. There’s a diversification of data sources in the future for marketers, which is only going to add complexity. As the Internet of Things becomes a more central part of the day to day lives of consumers, marketers will have far more channels to analyze and derive insights from in real time. Ander: One of the things that I especially enjoy about doing these interviews is speaking with people who have technical marketing expertise that, at one point, I did not have. And I’ve slowly been acquiring these more technical expertise as I’ve progressed throughout my journey as a marketer. The guy that we’re talking to today certainly has a grasping of those things, to say the least. I am here with Daniel Chalef, currently running marketing at Domino Data Labs. Daniel: Thanks, Ander. Nice to be on your show. Ander: Let’s start with a little bit about what you’re doing there right now. What is Domino Data Labs? And what is your role at the organization right now? Daniel: Domino is a central, collaboration hub for data scientists and a system of record for data science projects. Most strategic lines of business have systems of records. Sales organizations have CRM. Software developers have tools like GitHub. You have talent management systems for HR departments, and yet data scientists don’t have this tool that supports their workflow and is this canonical source for their projects or work. And that is really challenging for organizations, particularly larger organizations as well as folks within regulated industries. The Domino product is a system of record for the data science industry. It’s a CRM or GitHub combination for data scientists. We primarily work with much larger organizations. The problem is most acutely felt within larger organizations. Insurers and financial services companies are the mainstay of our customers. Ander:. Well, they are certainly are working with very large amounts of data. Daniel: Yeah, they are. So, when folks talk about ‘big data,’ you know… Most people don’t have big data. We like to think we have big data and we have big data problems, but those folks in those industries have big data. Ander: I think I know what you’re getting at there, but I’m curious… Is there a threshold where it becomes big data? I imagine there isn’t a fine line. Daniel: Yeah. Given that you can fit a terabyte of data onto your laptop, that’s not big data. Daniel: Big data is when you’re talking about petabytes of data. Or thereabouts. Or many petabytes of data. Ander: Right. Many, many thousands of terabytes. Daniel: Yeah. But, data science does not require petabytes of data to deliver meaningful solutions to the business, including solutions that drive competitive advantage. Ander: That’s something I’m really excited to get to later in this conversation. But before we dive into those topics, let’s hear a little bit about your background. As we discussed before we got started recording, you’re from South Africa. Let’s hear about how you arrived in San Francisco, as well as your journey as a technical professional and as a product person, a marketer, and a CEO in some cases. Daniel: Yeah of course. I’ve taken on a number of different roles in my career, everything from being a developer or programmer, a business analyst, to being a Chief Technology Officer and founder and CEO of an enterprise marketing technology company. Most recently I have – and this is my first line of business role – help lead up the marketing organization at Domino Data Lab. For most of my career, I’ve had a strong focus on product. I absolutely love technology. I love focusing on technology. I love understanding why people would buy their technology and being able to articulate the solution to their needs while aligning that with product and product strategy. I love helping people understand why they should buy your product and guiding where the product should go. At Domino, my current focus is very much on product marketing. I’m currently assisting with writing new website content, and spending a lot of time on sales enablement as well. As our sales organization grows and matures and we continue to sell to large organizations, some of the challenges become more acute around really being able to articulate benefits to a diverse number of stakeholders within these large organizations. So I’ve been working on material and other tools for doing so. Ander: Even though you have this very technical background, you’re in this product marketing function right now which comes down to cross-disciplinary marketing. And, if you’re going to be writing content for the website, I imagine you also have a close relationship with sales and with your product team as well. One of the things that I have found – both with myself and many of the other marketers that I speak with, especially those who are focused on more of the messaging and branding – is that many times, some marketers have less technical expertise than, let’s say, somebody who is very proficient in SQL or databases or anything else like that. You mentioned that you don’t have to be working with big data to necessarily use data science. Does that same thinking apply to when you are a more qualitative type of marketer and learning those types of skills? Daniel: So just firstly, just a quick clarification…I wouldn’t necessarily call that ‘data science’. It would be more just analytics and really understanding what the numbers are telling you. However, I really think that the most critical skill is being able to ask the right questions. You need to be able to frame the questions that guide your understanding of your business. And so there’s no point trying to manipulate numbers if you haven’t framed the questions properly. It’s really about what you need to be able to market more effectively – to be able to market more effectively to customers, to be able to do so in a more cost-effective way, and other very common business objectives. Ander: Of course. If we’re going to engage in career development or professional development, there might be better places to spend our time. Ander: Yeah, that makes perfect sense. In terms of forming the right questions to have the right answers to… In your mind, how do we as marketers do that? Daniel: There are a couple of ways to look at this. Marketers need to know who they’re selling to, they need to know how to reach them, and they need to manage a budget to be able to effectively market to those personae that they’re reaching. Ander: That’s all about breaking through the noise. That’s a phrase I use very frequently. Daniel: Breaking through the noise. And so, some of the questions that one would ask might be who are the folks that are downloading content or signing up for our webinars and are they really participating in the sales process? And it’s partnering with sales there as well around really determining who those personae are, the buyer personae. And then secondly, what channels should we use to reach them? Lastly, how much are we spending on each of those channels? This is a very rudimentary way of looking at it but your questions will stem out of those three meta-questions, if you will. Daniel: It’s understanding your business objectives that are important and that lead the questions, not necessarily the data that you have today, because, often we collect a hell of a lot of data. We’ve got all different types of systems, disparate systems, that are collecting data for us. We’ve got Google Analytics, we’ve got our marketing automation product, we have third-party content marketing tools, we’ve got a whole bunch of tools in our tool kit and they’re all collecting data. We can download reports from them. There’s no point having that data if you aren’t able to frame the question, if you aren’t able to ask the right question. And you can really spin your wheels. Yeah, you’ll find some interesting things like, you know, this type of person downloads these types of assets on Tuesdays. But how is that really informing how you’re executing? It’s framing the questions that inform how you execute – not necessarily the things that are purely interesting. Ander: Do you think that there are a lot of companies that are not framing the questions correctly because they’re using the data incorrectly? They’re not analyzing the data to the ability that they might be able to with the right skill set or the right technologies? Daniel: I think that often the questions that need to be answered are a lot simpler than what the data offers. We spend a lot of time investigating the data or anxious that we don’t have the skills to adequately investigate the data, when in fact the questions that we’re looking to answer, the ones that really move the needle, are simpler than we expect them to be. It’s really being able to drill down to what’s meaningful for your business. For example, it might not be relevant to be looking across different personae because the real impact of doing so might not really be useful for the sales team. They might be selling to everybody. Or, it might not be useful to be segmenting in the way that you are and thinking that you have to have data for every single segment and you have to analyze it in a certain way otherwise you might be missing something. Often the answer is a lot simpler. Ander: It sounds like people, in some cases, are too obsessed with data? Daniel: Yeah, they can be. And I think that there’s a narrative, particularly in the startup world where everything’s data first. Data is misused, it’s misinterpreted, and too often, as I mentioned, we ask the wrong questions or aren’t framing the questions properly and they don’t really deliver insight. It’s asking yourself what question I’m looking to answer and how do I frame it with this data? And I don’t want to make out that one doesn’t necessarily need skills to be able to extract value from the data and to be able to answer those questions. I’m saying that having the skills but still asking the wrong questions isn’t useful. Ander: We’ve talked a lot about establishing the right questions and asking the right questions, making sure that that is, first and foremost, something that you need to understand before you can make the most of your data. But then what do you do? What technology do you use? What is in your marketing stack? Are some specific products or maybe there are specific categories of products that are going to allow you to really make the most of your data? Especially in the context of top-of-funnel acquisition advertising. Daniel: Yeah, so most of my experience is enterprise marketing, really full funnel. But yes, top-of-funnel. You’re going to have tools like Google Analytics that are going to provide you with aggregate data, not necessarily with data that you can slice and dice by account or by account segment, for example, where a segment might be the size of company that you’re selling to. Or, if you’re B2C, it might be income for a household, for example, and an individual level for a household. Many organizations also use a marketing automation product of some sort or another. Now I mentioned a little bit earlier how Domino is a system of record for data scientists. Well, marketing automation products are really a system of record for marketers. Consumer marketers use them, business marketers use them – they use them slightly differently – but really, you’re going to have a tool that both automates some elements of the journey, the buyer journey for your buyer, but also that’s collecting a lot of data for you. Alongside that, you probably have a CRM of some sort. Most folks in B2B marketing use Salesforce, similarly from a marketing automation perspective there are really three or four leading marketing automation products ranging from Marketo and Eloqua to HubSpot, and some niche and up-and-coming folks like Autopilot. Ander: We’re big fans of Autopilot here. Daniel: Yeah. I figured I’d throw them in there. Haha. Daniel: Those are an array of tools that you potentially use. The marketing automation and CRM tools being the two systems of record – one a sales-centric system of record and that may contain a certain set of data, for example which customers have been closed and which haven’t. And then there is the other, the marketing automation side, which might have data as rich as how you acquired that customer including lead sources and the channel. Then there’s very often a bunch of other tools that you use for digital advertising platforms like Marin Software or something more lightweight like AdStage. These allow you to then control your Twitter, your Facebook, LinkedIn, and Google AdWords campaigns as well as retargeting platforms. Now it can become very challenging to manage sending of events… whenever there’s a conversion on a new website, for example somebody downloads a white paper or they watch a video, that’s a conversion event. And so what you want to do is you want to be able to send that data through to the various systems, for example with your retargeting – you want to tell the retargeting platform that this particular visitor has done something and you might want to put them into a different retargeting campaign. You will want to send that data through to Google Analytics, you’ll want to send the data through to your marketing automation product, etc. Now that makes for a very complicated web setup. So at Domino, we use a product called Segment, which allows us to put in place a single beacon or tracker on our website to consolidate your acquisition data into a single hub. Ander: We actually use Segment ourselves here and I interviewed their VP of Growth for Episode 4 of this podcast. Guillaume Cabane. We’re huge fans of what he does and everything that’s going on over there. Daniel: Another tool that that we use is Engagio, an account-based marketing product. We sell to, as I mentioned, large organizations. They’re really diverse. There are a large number of stakeholders within the buyer journey, and it’s very difficult to track individual leads within an account. Engagio provides you an account view of engagement with your marketing campaigns. Daniel: For example, you might have people downloading white papers, you might have people attending webinars or a conference, and it’s very difficult to see at an aggregate account view who’s engaging with your company and how they’re engaging. Engagio provides that sort of insight to the sales team so that they can execute accordingly. Ander: That’s great. That really clarifies things for some of us who might not have as much of a technical understanding of marketing. Daniel, where do you think all of this is going? What you think data might look like in terms of acquisition, in terms of advertising and marketing, a few years from now? Ander: Right. My, how that’s changed! Daniel: Yeah! My, how that’s changed. We’re now seeing a proliferation of data from other devices, internet of things devices, such as wearables that are looking at our exercise. Nike uses that, for example. I’m sure they pull in that data and are then able to understand their customers better based on the different lengths of exercises and types of exercise that they undertake. Cars are another example. Marketers at insurance companies, being able to understand how cars are driven, for example, allows them to tailor and develop new products that are most cost-effective for customers. And then they can then be more competitive within the insurance industry. Ander: And levels of personalization which before were unattainable. Daniel: And levels of personalization. Yes. Ander: Yeah. That’s really interesting and incredibly exciting. Daniel, it’s been a pleasure having you in here. Thank you so much for taking the time out of your busy schedule to stop by our office here in San Francisco. I know you’re right around the corner but thank you again for taking the journey down the street!One thing we like to ask everybody who comes onto this podcast is what we can do for you or the marketing community as a whole. What is something that we as the audience of this show can do to make marketing better? Daniel: Don’t get too hung up on the data and anxious about it. Ensure that you’re using it in the right way, which is to delight customers. Don’t overthink and over complicate your analytic strategy. Make sure that you and your team don’t overcomplicate your data analytics strategy. Don’t get too anxious about it. Ask the right questions. And make sure that you’re using the answers to craft great marketing campaigns. But don’t get caught up in the data – execute. Ander: If you don’t execute then nothing’s going to happen and all your data is useless anyway. Haha. that makes perfect sense. Daniel, again, it’s been a pleasure having you here. Thank you so much for coming by and I’m sure we’ll talk to you soon.